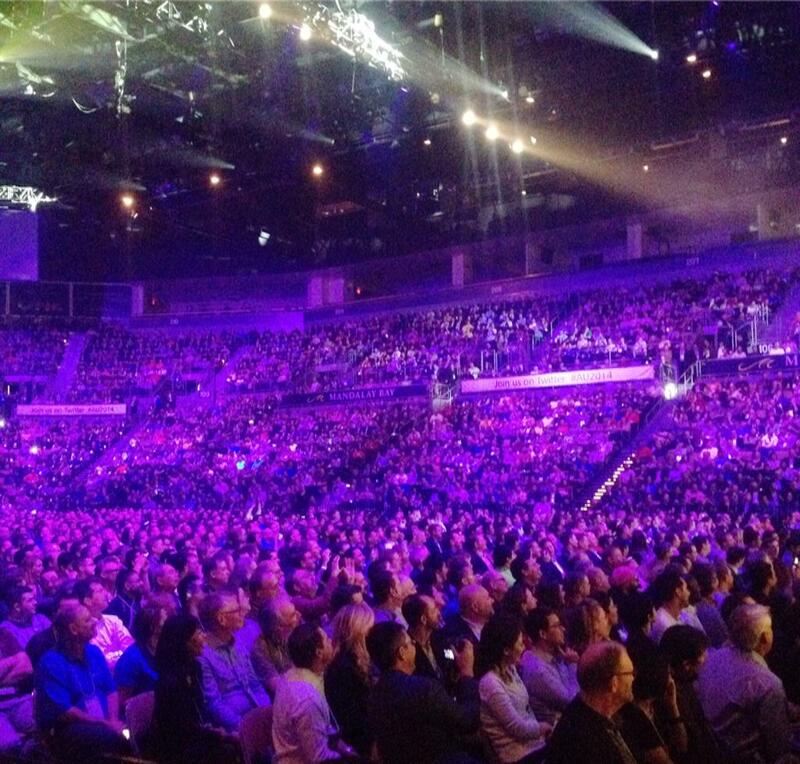 The arena was packed. Wall to wall people. Everyone rushing around trying to find a seat. 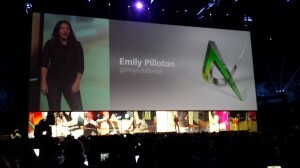 Lynn Allen opened the keynote followed by a Back to the Future skit and 20 gun t-shirt launcher that shot shirts across the entire arena. 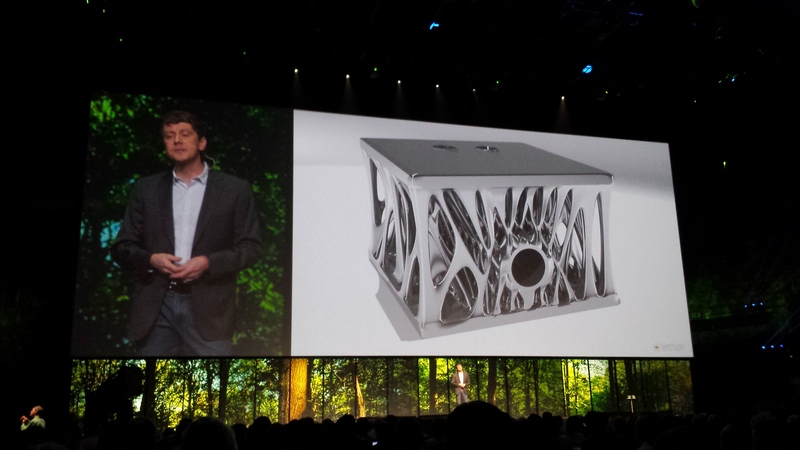 Jeff Kowalski, CTO at Autodesk, discussed how nature produces design. He says that we need to stop thinking of our computers as drawing tools, start thinking of them as design tool. He went on to say that today computers are able to design in ways that humans cannot. 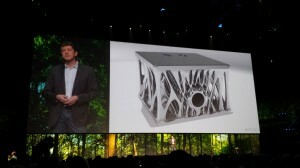 Generative design allows us to define the outcome and let the computer generate the design. Designers need to ask… How could generative design help solve your problems? Could you actually add “life” to it? or “What if your competitors introduce a product that has life in it? 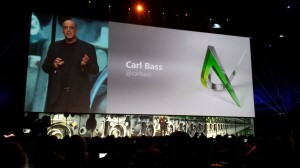 Carl Bass came on stage to rousing applause. In his usual casual manner, he started discussing how interactions with computers and design have changed. We use to interact with computers using just a keyboard and mouse. We now use point clouds. He then unveiled amazing point clouds and their uses. 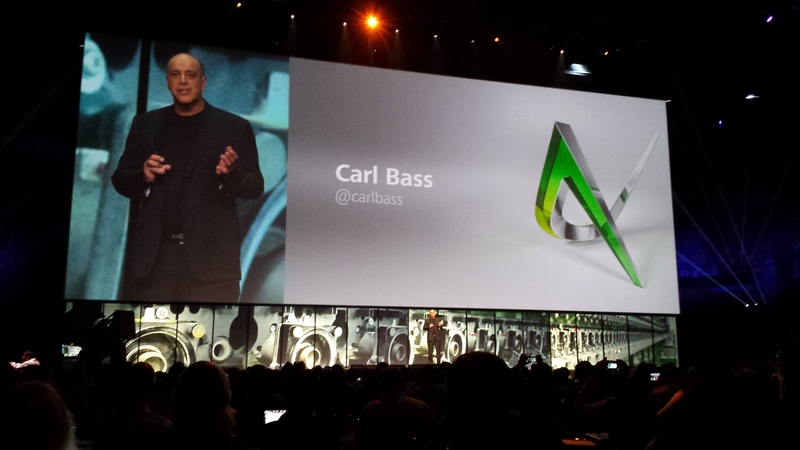 Carl Bass yielded the stage to Emily Pilloton Project H – housing for the needy and a farmers market design and construction project run by 16 yr old students. See a Ted Talk  by her. After fighting through the massive crowd, I made it to the AUGI Volunteer lunch and chatting with my AUGI buddies. I look forward to the AUGI Annual Meeting on Wednesday. My focus this year is education. Last year I attended many of the ADN classes… This year it is training and education. The first presentation of my day was on project based learning. They covered how to achieve maximum learning through focused project efforts. The goal for the student is not to be taught by an instructor, but rather to get the project completed. Along the road, learning is taking place. Teachers must leave behind former approaches to teaching. Allowing students to learn without the teacher being the focus of the learning. The project is the focus. There may not be an answer when you begin the process. The students discover the answers as they move along. The teacher may direct or suggest the next steps, but they let the student move on their own. Day two will wrap up with the Exhibit Hall opening – I can’t wait for that! !